This afternoon it was revealed that the former Foreign Secretary, Boris Johnson, accepted £14K worth of hospitality from the Saudi regime. 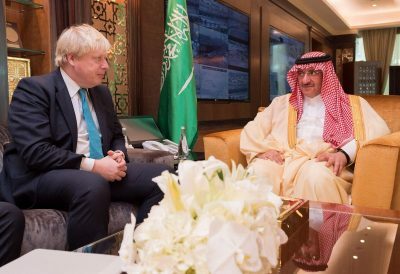 As Foreign Secretary Boris Johnson supported billions of pounds worth of arms sales to the Saudi military. “As Foreign Secretary Boris Johnson supported billions of pounds worth of arms sales to the Saudi regime and gave his full backing to its terrible bombardment and blockade of Yemen. Politicians should not be taking money from authoritarian regimes or dictatorships like the one in Saudi Arabia, which has an appalling human rights record and has inflicted a humanitarian crisis on Yemen.